Whether it’s caused by a power failure or a possum, an airline computer outage unleashes more problems more quickly than similar breakdowns in almost any other consumer business. A recent spate of technology glitches at U.S. airlines has inconvenienced thousands of travelers, spawned long airport lines, delayed or canceled flights and led to a wave of negative publicity. United Continental Holdings Inc.’s United Airlines unit suffered a meltdown June 17 that forced it to cancel 36 flights and delay another 100. US Airways Group Inc. was hit by separate glitches on June 10, 18 and 19. Alaska Air Group Inc. had its turn back in March, canceling 150 flights affecting more than 12,000 customers. Earlier in March, Southwest Airlines Co. experienced two separate technical foul-ups within two days, although the one related to the rollout of its revamped frequent-flier program didn’t delay flights. With packed planes leaving little room for error, airlines are trying myriad upgrades and other solutions to keep their computers running everything from flight dispatching to crew scheduling, passenger check-ins, airport-departure boards, ticket sales and frequent-flier programs. Cascading failures caused by unforeseen, unrelated, or untested circumstances. Now you know why some of us use milk of Magnesia as our coffee cream. I actually owned the Models EP on vinyl. There, I’ve admitted I’m out of the target demographic of all marketeers. 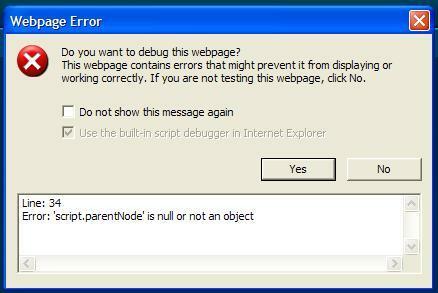 You do test it in IE, don’t you? The number of top-level internet domains is set to double over the next few years, after ICANN today approved the launch of a program that will let any company apply to run dot-anything. Many large companies are expected to apply for so-called “.brand” extensions – Canon and Hitachi have announced plans for .canon and .hitachi, for example. Yeah, your applications that check to make sure that the domains are fewer than 4 characters? All will be defective when this goes into effect. What Happens When The Valid Value Goes Away? I know all of your applications validate United States postal ZIP codes, right? Ha! I’m just kidding. We’re lucky if our applications actually limit users to five numbers or five plus four numbers. However, in the real world, sometimes valid values go away. Particularly if they’re maintained by a government or governing organization that handles industry standards. And woe be to you, wayfarer, if your application deals with both. In that case, sometimes the government will give you one value (or take away one value) where the industry organization gives you another (or takes it away or does not take it away when the government does). So what’s your plan for that? Don’t think only in terms of how your application will react (badly), but also how your organization will deal with them procedurally. Or when the clients or users start calling to raise holy Dis. Posted in Miscellany | Comments Off on What Happens When The Valid Value Goes Away? 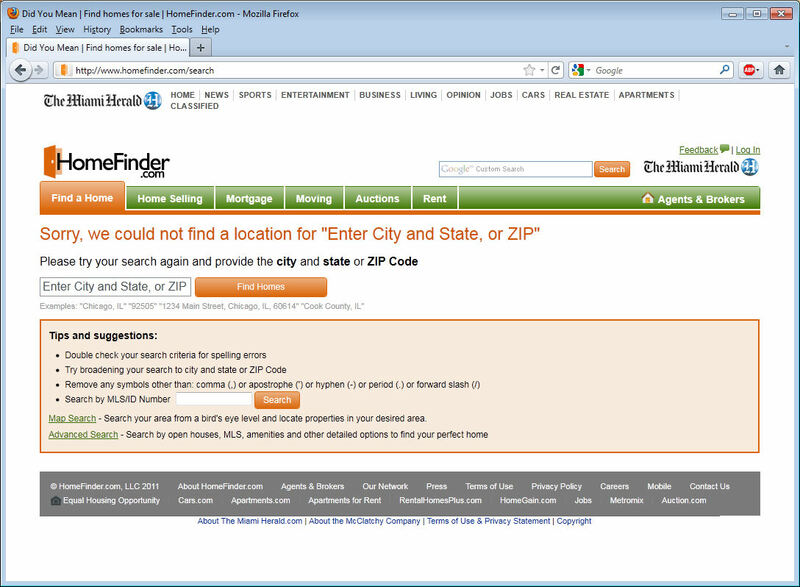 Which defects can you find on this results page from Miami Herald-badged Homefinder? Hint: If you try now, you’ll find at least one of them is fixed. Details have emerged has to how hackers were able to steal over 200,000 Citi customer accounts, including names, credit card numbers, mailing addresses and email addresses. It turns out quite easily, in fact. All they had to do was log in as a customer and change around a few numbers into the browser’s URL bar, NYT reports. Facepalm. I wish they would have put their names to it so the real world could know which security experts would call this an ingenious exploit of a browser flaw. Seriously. Dudes, and I say “Dudes” because that’s how the other kids in your college dorm address you, this is not a browser flaw. This is an application flaw. And one that you could fix if only you, I dunno, were “experts” in basic software testing. UPDATE: Maybe those security experts quoted by the New York Times were the in-house team responsible for the recent New York Times pay wall fiasco. Brad Wells found the Easter egg. Aided by a little Google searching, he found out how to activate a fake blue screen of death–one of the “legacy” leftovers from the PC era Google hopes to banish with its browser-based operating system. Which leads me to my official QAHY pronouncement on Easter eggs: professionally, I am against them and argue against them any time I can. Why? It’s a nugget of code thrown in that does not apply to the function of the application. Sure, it’s a spot of fun, but it’s extraneous code, and extraneous code has the chance of being buggy and whatnot that all other code has along with a) the possibility it won’t be tested if someone is sneaking it in and b) the possibility that it won’t be kept up-to-date or retested in later versions. Also, I am against any developer having any spot of fun at any time for any reason (unless they appear in my novel, available now!). In the software development world, we like to think we can artificially constrain environments to a limited subset of real-world situations so as to limit our time required for testing. We don’t want to test in IE 6 because our organizations’ designers no longer think it’s cool and whatnot. In a large chamber at the Food and Drug Administration labs here, scientists are bombarding medical devices such as pacemakers and hearing aids with electromagnetic waves. Their goal: to see how safely the critical medical devices can interact with the growing volume of waves people encounter daily from increased use of electronic gadgets like microwaves, airport scanners and cellphones. The so-called anechoic chamber, which measures nearly 36-feet long, is made of special material that absorbs electromagnetic waves. It’s considered to be the purest way to measure interactions between medical devices and electronic gadgets because there are no echoes or reflections of electromagnetic waves from the chamber’s walls or ceiling to affect the calibrations. The research effort, led by the FDA, has resolved such mysteries as why a type of electronic wheelchair tended to start itself and drive out of control, and why some people with spinal-cord stimulators, implanted to help control chronic pain, collapsed after passing through a metal detector. Still unresolved, the scientists say, is how to stop the screeching noise that hearing-aid wearers experience when they try to use a cellphone. Researchers also are trying to understand how a new technology widely used to track inventory in retail stores might cause problems for people with pacemakers. I often say I’d like to test for Underwriters Laboratories so I could fire Howitzers at things, but it sounds like the FDA has an environments lab to envy. So what’s my point? Your organization might think it has a grasp on what your users are going to do and into what environments your clients will (or MUST according to you) install your applications, but remember all your legalese terms-of-use hand-waving matters only so much in the real world. Posted in Miscellany | Comments Off on Think Environment Doesn’t Matter? AC/DC: Not Music To QA By? Every sensible swimmer knows that avoiding a school of bait fish or immediately leaving the water if a cut started to bleed is ‘best practice’ when attempting to avoid a meeting with a shark. But Eyre Peninsula’s Matt Waller has added another tip to the ‘don’t get eaten’ handbook with his discovery that Great White’s are much less aggressive when listening to ACDC – particularly ‘You Shook Me All Night Long’. I don’t know if I’ll like it so much when we have to crank up Enya in the lab to improve productivity. QA Music: Men of a Certain Age Might Recall…. Replace the “Flash” with “QA,” and you pretty much sum up the proper role of QA in any organization. Posted in QA music | Comments Off on QA Music: Men of a Certain Age Might Recall…. The authors examine whether and how observing anger influences thinking processes and problem-solving ability. In 3 studies, the authors show that participants who listened to an angry customer were more successful in solving analytic problems, but less successful in solving creative problems compared with participants who listened to an emotionally neutral customer. In Studies 2 and 3, the authors further show that observing anger communicated through sarcasm enhances complex thinking and solving of creative problems. With this scientific paper backing up our value, I think raises are in order. I don’t think most organizations need to pay a consultant to teach them that. They’re all pretty good at avoiding the risk of quality already. You are currently browsing the QA Hates You weblog archives for June, 2011.